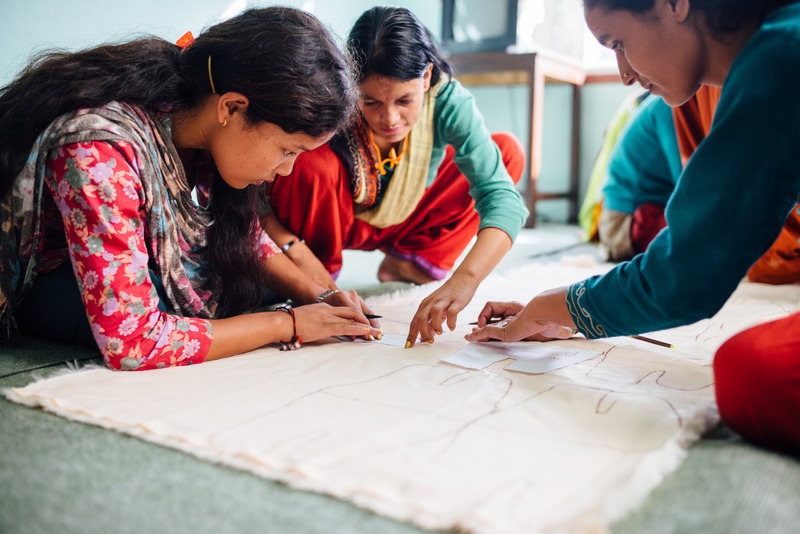 Photo: Girls in our Nepal rehabilitation program work on popular clothing patterns which they must learn and commit to memory in order to receive their seamstress certification upon graduation. We are happy to report that 14 girls (ages 15-23) graduated from our Nepal ‘She Has Hope’ trafficking rehabilitation home on June 30th. To celebrate, our native team served the girls delicious Nepali vegetables, rice, fruits, and desserts. Nine of these girls are planning to start their own tailoring businesses in their home villages. We hope that with their newly acquired skills, they will be very successful in their new business ventures. The girls’ success in completing their 6-month skill development program and graduating is the fulfillment of our goal to equip girls enrolled at the ‘She Has Hope’ home with everything they need to know to stand on their own, healed and full of hope. One such redemptive story is that of Lekha, a former graduate from our rehabilitation home. She described her history in her own words: “I am Lekha. I was lured by one of my distant relative’s son who promised to marry me. But I was unaware that I was being sold to another trafficker. Later I was rescued by a women’s welfare organization from Surkhet after 28 days of being held prisoner in a hotel. During those days I was mentally and physically abused.” Thankfully, Lekha came to live at our home in early 2017, where she lived with us for 6-8 months, receiving counseling and medical aid, and safe room & board. She became proficient in several craft-making, seamstress, and cooking and gardening skills, and received support in basic literacy through daily coursework offered by our faithful, full-time teachers. The girls’ garden project not only provides them with nutritious, organic ingredients for their meals — such as the 22 pounds of tomatoes and the 11 pounds of spinach the girls harvested this month — but it also gives them the understanding of advanced gardening techniques. They leave the home with the ability to start their own gardens to provide for their own nutritional needs. And through their craft-making and seamstress work, girls such as Lekha learn how to sew various popular styles of Nepalese and Indian dresses, make stuffed animals, and knit sweaters, gloves, and baby hats. They also learn how to make beautiful jewelry, such as necklaces, bracelets, and earrings. Many of the girls’ crafts are sold online at SheHasHope.org, and all proceeds directly support their rehabilitation. 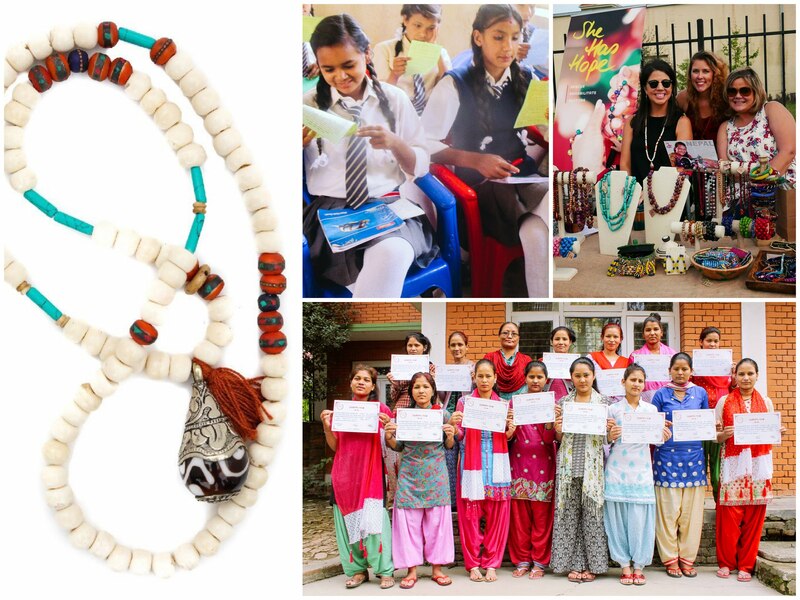 Photo inset: (Far-left): The girls in our Nepal rehabilitation program have learned several new jewelry designs, including the Diana necklace sold online and at our pop-up shops. (Top-center): Our Nepal team recently held a trafficking awareness counseling class at a local high school. (Top-right): Volunteers at one of our She Has Hope pop-up shops enjoy selling crafts made by our program participants. All proceeds go back to funding the program. (Bottom-right): Fourteen girls recently graduated from our Nepal rehabilitation home; nine of the girls plan to start their own tailoring businesses. This month 15 new girls (ages 15-23) were rescued from various locations in India and Nepal and were brought to live in the safety of our home where they will receive the same benefits as Lekha, changing the course of their lives forever, providing a future of hope, peace, and economic independence as they will also be taught the fundamentals of small business accounting within the skill development program. Thus, if they start their own businesses such as some of our June graduates, they will be fully equipped to run their businesses with success and profitability. A big part of our mission is to prevent girls from being part of the tragic statistic that 20,000 Nepalese girls are trafficked across the Nepal-India border, mostly into Indian brothels, every year. We organize trafficking awareness counseling classes in public schools where we train local girls how to be aware of and avoid the lies and dangerous practices of human traffickers. Our training classes, which are formatted in a workshop & discussion style, allow the girls to talk about guilt, fear, shame, anger, and their safety — they are encouraged to be open and honest and learn from each other’s experiences. They are also taught to identify different types of problems and dangerous situations, and they are given solutions. Our most recent effort in such prevention and education was the class we held at Saraswoti High School, where we reached 48 girls who are now empowered to recognize the deceit of traffickers and make wise, safe decisions. In other good news, during the month of June, She Has Hope sales at pop-up shops and online crossed the mark of $10,000, representing almost four months of operating expenses at our Nepal rehabilitation home. We did pop-up shops at Pondicheri Bake Lab and Big Power Yoga, both in Houston, Texas. Our online sales have flourished thanks in large part to several new jewelry designs the girls learned from one of our volunteers, a jewelry designer, who traveled from Houston to visit the girls in July 2016 and March 2017. She expanded the girls’ jewelry-making skills by helping them to source new beads, showed them how to properly close/clamp long necklaces, and taught them to make earrings using a new technique. One of the designs the girls learned to make under our volunteer’s instruction is the Diana necklace, sold in our online shop at SheHasHope.org, which is handcrafted and features medium bone beads and medium wooden beads that were handpicked in the local markets of Nepal. A large black tear drop pendant with a small tassel finishes out the design. None of our efforts to keep Nepalese girls safe would be possible without your purchases and continual support — thank you for making what we do for these girls possible.